Cedar is a durable softwood timber usually sourced in North America. Its colour is brownish red and because of its durable properties it has been used in recent years as a cladding for buildings. In my opinion it has been used excessively and usually has not been protected against the elements. It therefore usually looks terrible after wet weather. It is worth considering whether this cladding is more suitable for buildings with a dryer climate than Ireland or the UK. Even a durable timber like cedar needs to be sealed against water ingress to protect it. All timber will absorb moisture in damp conditions and release it again in dry weather. The recent craze for using cedar cladding hasn’t extended to understanding that the timber must be sealed. As a result, buildings clad thus, can have a really miserable look after wet weather, having a dark, wet and blotchy appearance. It is hard to think of a cladding that would seem shoddier after wet weather. See photographs below, it is worth noting that both of the buildings below have been completed within the last three years. See also a suppliers viewpoint in comments section below. Western Red Cedar (thuja plicata) is actually mostly sourced from West coat Canada (Vancouver area BC). Like all timber, it darkens when it gets wet and bleaches to a grey colour if left natural due to UV degradation. It requires no treatment whatsoever, unless a low grade of WR Cedar is used and contains sapwood which requires preservative treament). The only reason anyone should coat Western Red Cedar is to help prolong the natural colour of the timber, this is usually the start of the problem on building sites. Coatings require maintenance and the proper coating must be specified in the first instance. 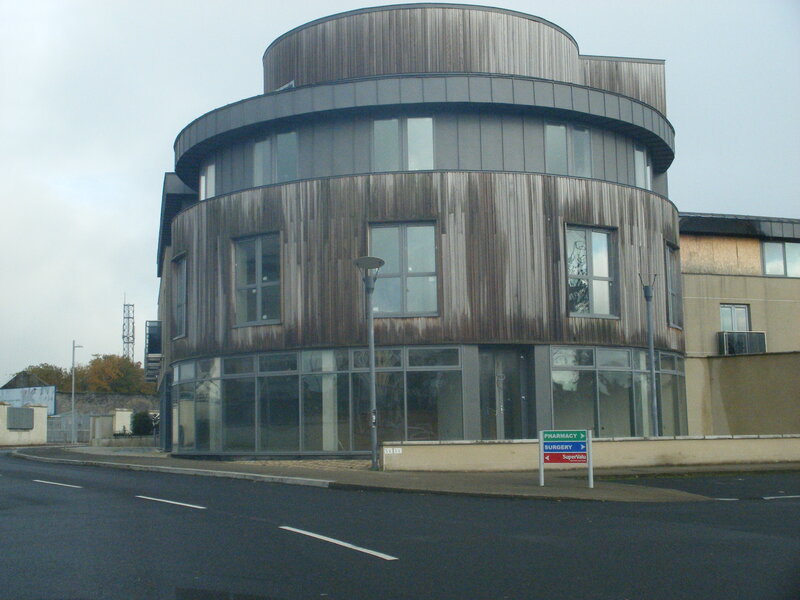 The second picture you have shown is a project in Crumlin, Dublin if I am correct. This project was originally varnished which is clear example of what NOT to do. Firstly Varnish should never be used and secondly, the coating must be maintained. Cedar can be used without any treatment and can look very well. Architects and should also share in the responsibility as the design of any building can have a dramatic effect on how any wood element (cedar or otherwise) behaves. Consideration should be made regarding any timber elements partly sheltered by balconies / soffits / overhangs. South facing elements weather much faster that other elements. If coating is required, a natural wood cladding oil such as Osmo UV Cladding Oil which contains anti fungal inhibitors should be specified along with a regular maintenance programme. The dark / wet / blotchy appearance of weathered cedar is as a result of Tannin / extractive bleeding from the timber. This eventually weathers to a uniform grey colour is exposed but sheltered areas wont weather as fast or as uniform as clear open panels. Cedar ticks all the boxes in terms of affordability, durability and stability. No one should be afraid of using Cedar for Cladding. Just get the right advice from the right people unlike in the past few celtic tiger years where the material was just thrown up on the side of a building without any thought on grade, performance or maintainence. Thanks for the input. Some good points and getting the right advice is always important. Regarding your point about untreated cedar, I have added another picture of untreated cedar cladding, this time with algae growing on it. Just as an added point any timber and numerous materials are suseptible to fungil growth dependent on uv % available over time. Most people are unaware of the importance of good circulation and natural light when choosing products/materials. Thanks for the additional picture with Algae growth. This is a prime example of poor detailing by an Architect. It is always recommended to stop any wood cladding 200mm – 250mm above ground level to prevent indirect wetting (splashing off ground). 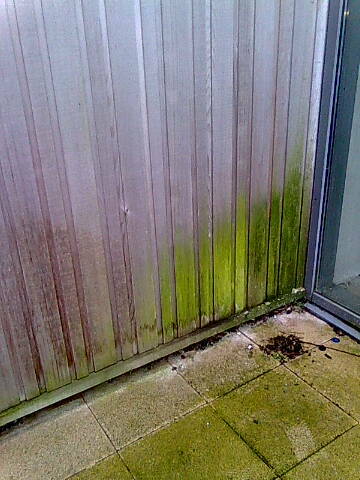 Indirect wetting as a result of splashing off the ground or other horizontal surfaces such as roofs or balconies, below the cladding, can lead to a deterioration of surface finishes and possible algal growth. Are there any other common mistakes designers make? I am a building designer and always strive to getting it right. 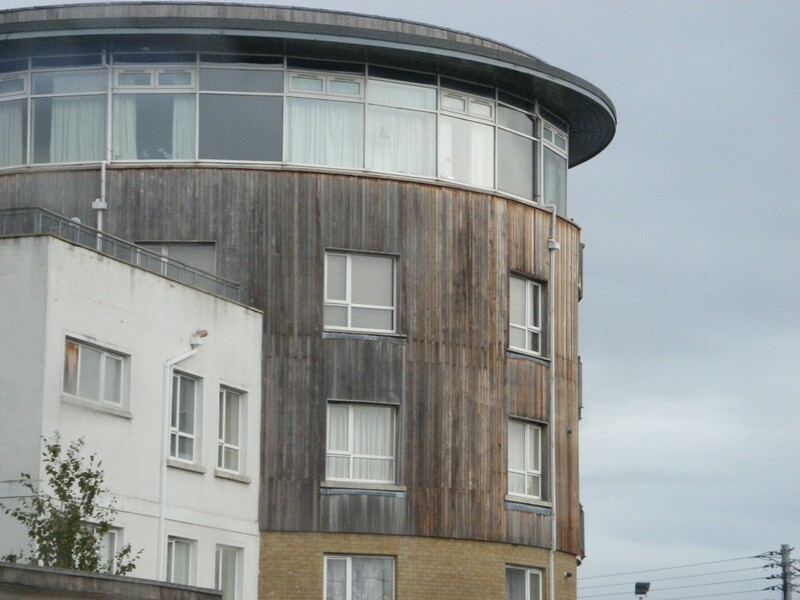 so, can you please advise on what treatment cedar cladding should receive to maintain its new appearance when first installed rather than having the grey appearance when it has weathered. the situation where the cladding would be specified is on gable ends of roofs, dormer windows and cheeks and to the faces of a single storey home office clad mainly in cedar and glass built off a masonry plinth say 200-250mm high from ground level to avoid any splashing staining the boards. I have read that Alkyd resin based stain should be used, so i am trying to accumalte as much info as I can to advise my Client accordingly. can you let me know what treatment cedar cladding should receive to maintain its new appearance when first installed rather than having the grey appearance when it has weathered? I would appreciate some tips on what to use on cedar cladding also. I am looking at cladding a house in it, but want to keep the cedar colour as long as possible. I am not a fan of the greying over time, so will be treating and maintaining it as regularly as required. Woodoc products are proven to be one of the few products who can cope with Cedar Wood, as the exterior products are a blend of long chain algae and have UV protection and some are even resistant to salt environments. Adding a stain will improve the UV resistance. Woodoc offers film forming (Woodoc 30 and Woodoc 50) and non film forming products (Woodoc Wood dressing). Please get in touch for advice. We sell cedar all over the country north and south. http://www.corell.ie . If you are looking to retain the natural colour of cedar then I would suggest using an oil based stain like an OSMOS 410D. Also have a look at SIKKENS Cetol. Its a water based system which is best applied to the timber with a vacuum coater. Any advise – we have 2 cedar windows facing west in direct afternoon sun -Iwant to paint both windows not stain what preparation do you advise. Woodoc 35 is not currently listed, but we do stock it and can supply it if you are interested in a low-gloss finish. did you every get an answer to this query? to clean the surface and leave it to age again. Please note that the greying is the breaking down of the lignin in the wood which allows the growth of algae and mould under the first layer of wood. Woodoc Wood Reviver will take off this dead layer of wood cells and clean the algae. If you then leave it, the process will re-start. However if you want to slow down the ageing (i.e. the UV breaking down the lignin of this first layer of wood) and prevent the re-growth of algae, after cleaning the wood with Woodoc Wood Reviver, you can then use Woodoc Wood dressing to treat it. Woodoc Wood Dressing is a non film forming oil based product, with UV protective compounds and anti-mildew compounds which would be ideal for a North-facing surface. Some of our customers who love the greying of the wood, and want to preserve it, choose one of the 4 available greys we offer to add to our Wood Dressing (Wood Dressing is a clear product). Our colours are all semi-transparent, designed to show the wood underneath and give a more natural finish. The best way to preserve cedar cladding is to apply a product ( supplied in UK ) called Di-ard. It is a quateri-ammonium disinfectant which is used to kill Algi and other fungal growth on a wide variety of surfaces, ie concrete, slabs, glass and wood. It comes as a concentrate which is diluted with water and is relatively harmless to the environment. If timber is treated when dry , in say sting or summer, itwill kill the Algi and penetrate the wood and preserve it until the following summer. So here’s a question: we are using cedar cladding on the wall of a 1.5 meter deep, north facing veranda on an old stone house. I like the grey weathered effect but in this position this is obviously not going to happen for many years, if ever. The supporting oak pillars will be exposed to the weather. How can I ‘age’ the cedar to match? I’ve thought about using a grey exterior wood stain or would I be better just leaving it to take it’s chances? Woodoc Wood Dressing is a non film forming oil based product, with UV protective compounds and anti-mildew compounds and the colour are semitransparent iron dioxide which will not fade in the sun while showing the grain of the wood underneath and providing a more natural finish. Please do not hesitate to give us a call for further information (01223 655 686) http://www.woodoc.biz. I’ve just moved back to the UK after thirty years as a GC in the US. I hate to sound cocky but the designers and builders don’t have a clue over here. Some of the designs and claims made by architects/designers can only be explained by either a total misunderstanding of the characteristics of Red Cedar or a willful intent to deceive. Check out Dartington Primary School to see where I’m coming from. Cedar is notoriously difficult to treat as it is rich in oils and resins so products often struggle to penetrate it and then over time are pushed out by the oils and resins. Woodoc products are proven to be suited for Cedar wood (one of our best client installs garden offices and garden room and has been using Woodoc for years with excellent results). Our products are microporous so over time they let the natural oils come to the surface. Our customers often comment that a few weeks after applying Woodoc (once cured) they start smelling that wonderful Cedar smell again. Woodoc Wood Dressing – Non film forming, completely mat, requires minimum preparation, it can be applied to rough surfaces and we recommend a seasonal application. It has UV protection and anti-mildew compounds. Woodoc 50 – Film forming, gloss or matt finish, with UV protection compounds and marine grade salt environment resistant compounds. Please give us a call (01223 655 687) if you have any questions or would like further advise or visit http://www.woodoc.biz. Hi we have some untreated western red cedar on our house approx. 12 months old starting to grey is it to late to treat ie retain original colour and if not what is the best treatment to use any help would be greatly appreciated thankyou. Patrick, were you able to make any progress on this? I am in exact same position with same goals. Please explore Woodoc exterior range, and in particular Woodoc Wood Dressing for an easy to apply, UV protecting and mildew resistant product. We will be very happy to talk to you about any project you have and offer advise. Please call 01223 – 655 686 or visit our website http://www.woodoc.biz. I would agree, exterior wood cladding really does require a lot maintenance and tons of awareness when it comes to the type of weather/element it has to go against with. Most homeowners and building owners are too in love with the architecture and design that comes with wood cladding but fail to see that its prone to rot if not maintained properly. However, I still believe that exterior wood cladding is one of the best ways to accentuate any building or home (see some samples here http://kebony.com/us/blog/exterior-wood-cladding/ – . I think contractors and architects should also inform their clients the amount of maintenance it requires. That’s why you choose sustainable wood products. Sustainable wood products comes with eco friendly certification and also offers more durability and sustainability over normal wood. I would recommend Cetol WF771 as it goes on like water and will not peel. I cannot decide what to do…I woud lke light grey cladding as in weathered Siberian Larch, but apparently it takes 9 years to get to that lovely silvery finish. Secondly, I am worried about the wear and tear from weather conditions in UK and the subsequent soaking of wood. If we varnish it it won’t weather right? Shall we use somme sort of wood colour to stain? Or I am also thinking of a wood composite as alternative but they don’t come in thin sizes. We have ceder cladding on our house extension which is 13 years old. Over the years we have treated it with Textrol but it has still greyed and we are not happy with the colour now. We chose a rough finish timber which we love but we really want the warm ceder colour back. What can we do? Is there any way to get the colour back? It is better in the summer when the timber has had a chance to dry out but in the winter it’s very grey. Best way to restore the colour but leave the rough finish would be to soda or CC blast it. I spend my life blasting beams and cladding (amongst other things). Depending on your location happy to take a look and advise. Plenty of advice from others on here to help you keep the original colour. Soda Blast East 0044 1933 628249.